The solution to convention tension, high-tech recharge pods and lounge, splashed with your branding will immerse guests in hospitality and modern trends. Recharge Pods are state of the art recliners designed to amaze your guests by “turning-off” trade show fatigue. Each Pod envelopes guests with music-noise canceling head-sets and ergo recliner. 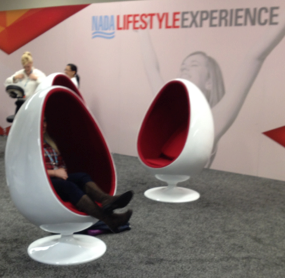 Recharge Nap Pods - Draped in modern branding that will drive show floor conversation for any sponsor. Aromatherapy Sticks - Brand ambassadors will greet guests with aromatherapy sticks, to draw out their relaxing senses. Guests can choose between four flavors. Head Set Music - As guests lounge, they can choose heads to play soothing music or cancel the ambient event noise. This Promotions Includes - Lounge branding recharge pods, music-noise canceling head-sets, aroma therapy sticks, signage, floor graphics, literature distribution & brand ambassadors.